Fell is an interesting tale that combines both noir and dystopia in a rather fascinating way. The story centers around Detective Richard Fell, a clever (probably too much so for his own good) police detective who has recently been transferred to the “urban trashzone” known as Snowtown. While the events that led to Fell’s transfer remain mysterious for much of the story, it’s a pretty easy assumption that he messed up big time. Snowtown has a total of three and a half officers, four now that Fell has arrived, for the entire urban area. As you might expect, this is woefully inadequate for an area as crime ridden and desperately poor as Snowtown. Fell’s superior, Lieutenant Beard, copes with the impossiblity of the job by taking enough drugs to remain mostly insensible and no one expects much of Fell. But Fell is determined to provide some measure of justice to Snowtown while he’s stuck there and uses his skills of Sherlock Holmes level observation and judgement of human nature as he navigates the dark alleys and even darker human minds in his new home.Fell is written by Warren Ellis (known for Red, Planetary, Hellblazer and Transmetropolitan to name just a few), a creator well known for his sociocultural and political commentary. Ellis is a perfect choice for this sort of story and it’s right up his alley. For fans of Transmetropolitan, Fell will feel quite familiar. With the main character being a detective rather than a hotshot reporter, the story remains more noir than dystopian comedy but Ellis’ flair for writing intriguing characters stuck in dark, corrupted environments remains excellent. Fell is not an entirely altruistic character but much like Spider Jersusalem, he does his best by the city that he serves and the cast of characters around him, while not exactly politically correct, are both entertaining and intriguing. Anyone who enjoys noir and intrigue will find a lot to like in Fell.en Templesmith has worked on a number of licensed properties including Hellspawn, Star Wars and Doctor Who but really made his name with 30 Days of Night and then Fell. Templesmith’s style is distinctly “painterly.” He uses minimalist linework combined with a sort of abstract, watercolor style to create an almost dreamy effect in the panels. The palette alternates between warm, dull browns that comprise much of the sequences during the day and evoke a sense of the ugly, urban environment and cool blues to illustrate the dark alleys and forboding nights of Snowtown. This kind of muted color scheme is an excellent contrast to intensely colorful elements in the panel like the characters’ eyes and hair, graffiti and important items that he wants to draw the reader’s attention to. This style lends itself very well to a noir story like Fell and I was caught up by the way the writing and art blended to create a fascinating world that draws the reader in.If you’re at all a fan of noir and dystopian environments, Fell is a cannot miss story. The pairing of Ellis and Templesmith blends spectacularly well and once again Image finds a great creator combination for an unusual and compelling story. Fell is a noir style comic about detective Richard Fell, who gets transferred from the big city across the bridge to Snowtown, a shady slum, under some yet to be revealed conditions. The comic brilliantly follows how Fell gradually adjusts to Snowtown and learns that maintaining the law there is quite different than what it wan in the big city. Ellis' text is as good as ever on every aspect and Templesmith's art is a perfect fit for it. I don't like it when art gets too fuzzy but Templesmith manages to make his art suitably fuzzy so that everything is still clear and you don't have to try to figure out what he's trying to draw, like what happened in the second story arc of Desolation Jones.Very enjoyable Ellis-noir. Much recommended. These are the tales of Richard Fell, a detective recently reassigned to the god-awful city of Snowtown, where law and order seem to be completely irrelevant concepts. A series of self contained tales that have a certain continuity running through them, they tell of Fells fight to impose some sort of justice system on this hopelessly degenerated place. 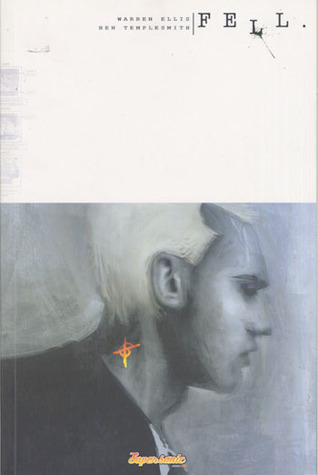 Wonderful stuff as usual from Ellis, with suitably atmospheric art by Ben Templesmith (30 Days of Night), this was actually a concept book - read the backmatter to find out more. Well worth a look. Eight modern noir stories revolving around Detective Fell navigating his new turf - a bizarre town full of mayhem and weird-creepy things. Something very appealing in the construction of Fell over these eight short stories - he's a very likable guy who means well, tries hard, and doesn't always get it right. I really enjoyed this, I hesitate to talk much about what I liked. I always feel like it's best to go in uncertain of what you're getting yourself into. But I was into this series. Not entirely sure I'd recommend it to everyone, but it's work getting the first issue and seeing what you think. Warren Ellis, you´re lazy f**ker! Every story should have end, especially the good one.Read it a couple years ago. Thrilling, scary. Templesmith's drawing's great. Warren Ellis Ben Templesmith Michele Foschini - Warren Ellis is the award-winning writer of graphic novels like TRANSMETROPOLITAN, FELL, MINISTRY OF SPACE and PLANETARY, and the author of the NYT-bestselling GUN MACHINE and the “underground classic” novel CROOKED LITTLE VEIN. The movie RED is based on his graphic novel of the same name, its sequel having been released in summer 2013. His graphic novel GLOBAL FREQUENCY is in development at Jerry Bruckheimer TV for the Fox network, and his GRAVEL books are in development for film at Legendary Pictures, with Tim Miller attached to direct. IRON MAN 3 is based on his Marvel Comics graphic novel IRON MAN: EXTREMIS. He’s also written extensively for VICE, WIRED UK and Reuters on technological and cultural matters, and is co-writing a video project called WASTELANDERS with Joss Whedon that will appear some time before we both die He is serialising a new graphic novel, TREES, with artist Jason Howard, through Image Comics. Warren Ellis is currently working on a non-fiction book about the future of the city for Farrar Giroux Straus. His newest publication is the digital short-story single DEAD PIG COLLECTOR, from FSG Originals. His next book will be the novella NORMAL, also from FSG.A documentary about his work, CAPTURED GHOSTS, was released in 2012.Recognitions include the NUIG Literary and Debating Society’s President’s Medal for service to freedom of speech, the EAGLE AWARDS Roll Of Honour for lifetime achievement in the field of comics & graphic novels, the Grand Prix de l’Imaginaire 2010, the Sidewise Award for Alternate History and the International Horror Guild Award for illustrated narrative. He is a Patron of the British Humanist Association, an Associate of the Institute of Atemporal Studies, and the literary editor of EDICT magazine.Warren Ellis lives outside London, on the south-east coast of England, in case he needs to make a quick getaway.